Gifts for Men: Silver Drinks Stirrers, Measures and Cocktail Forks, vol 1. Men’s Gifts. Gifts for Men…. Why is it that whenever you need to find a Gift for a Man; your Dad, your brother, boyfriend, boy friend, a graduation present; every important Man in your life, you’re filled with dread – What can I possibly buy that he doesn’t have already, you shreak! Well, fear not, at Tiffinware we’ve been designing Gifts for Gentlemen for a few years now and add to the range as often as possible. 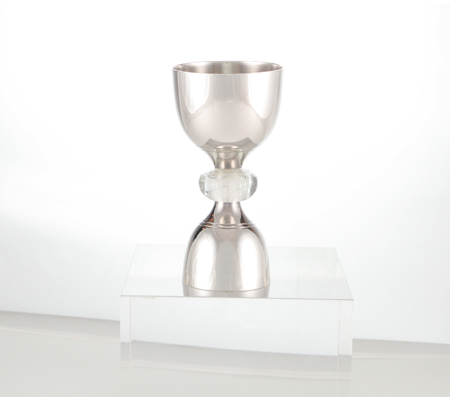 We have lots of barware (vol 1 – pun intended!) 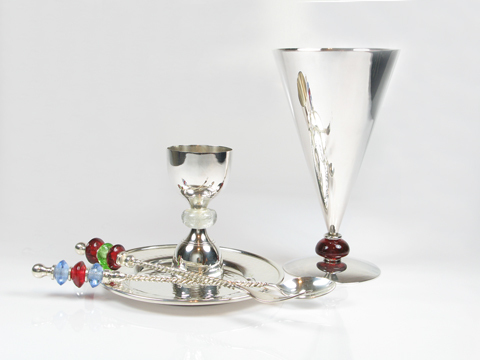 – silver plate Drinks or Cocktail Stirrers, Drinks or Peg Measures, Lemon or Cocktail Forks, Wine or Drinks Coasters, a marvelous and stylish silver-plated Cone Pot for housing these implements. Let’s start with the Swizzle or Cocktail Stirrers/Sticks – we love these elegant, rather decadent looking Drink Stirrers, an absolute ‘must have,’ for any bar worth its salt! Or should I say Tequila, that’s what you drink with salt right?! The Drinks Stirrer and Lemon or Cocktails Fork, both have decidedly delicious ‘barley twist’ stems. The versatile Swizzle Stick, can be used for stirring iced tea or coffee, hot spiced drinks like apple tea, mulled wine or a hot toddy when you’re a bit under the weather. The Swizzles can also be pressed into service as a long-handled jam or chutney spoon. Of course, it would be in its element stirring Bloody Mary’s or Screwdrivers, at a lovely Sunday lunch! 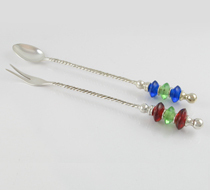 Silver plated Cocktails and Drinks Stirrer and Lemon Fork, both beaded. The Lemon or Cocktail Fork is another fabulous bar accessory, great for popping lemon slices into Gin or Vodka Tonic, olives, pickled onions into dry martinis, cherries, pineapple, orange slices in to delicious cocktails ….. whatever tickles your fancy cocktails! Slurp up!! Gifts for Men : silver plated Drinks or Peg Measure, hand made. The Drinks, Peg Measure, also known as a pub or spirit measure, is an extremely important piece of equipment for every well dressed bar as it’s the regulator of all Barware. All drinks, especially cocktails should be measured, otherwise you might end up with strange tasting or unappetising drinks, which wouldn’t do at all eh? The measures are 30ml and 60 ml respectively. Our Drinks Measure has a beautiful hand made bead which is interchangeable, allowing you to cutomise your purchase to go with the decor of the room, the bar or your party’s theme?! Blue, pink, sunshine yellow!! 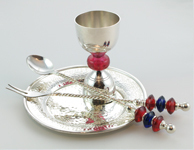 Our small Salver or hammer finish Plate is extraordinarily useful; as a wine bottle coaster, a drink coaster, as the small plate that catches all the drips from the Cocktail Spoon and Lemon Fork, and as the rest for your Drinks Measure. And last but not least, the stylish Cone Pot, which houses the Swizzle Sticks, Stirrers, Cocktail Forks, and anything else you have on your bar – its a great, multi-purpose Bar Accessory.